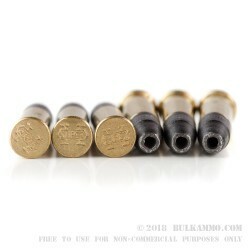 About as perfect a middle range round for the .22LR that you can find. Balance, tradition and versatility are the name of the game here for this Super-X .22 Long Rifle. A great balance has been struck between components, noise, cleanliness, reliability and consistency for this load and it tells a great story about the use cases for the ammunition. Lower noise powders and powder charge give you better environment while shooting, and the subsonic load that exits the barrel at 1065 fps isn’t exactly underpowered, but does offer some good compromises for those looking to enjoy themselves at the range. The lead bullet is not clad in copper, so it will have a bit more fouling than copper bullets, but it won’t be considerably more, the round still shoots fairly clean comparatively. Winchester has gotten quality control down to a finely oiled machine at their various factories, and you can rest assured that these will be among the more reliable and consistent loads for the .22LR you will find. 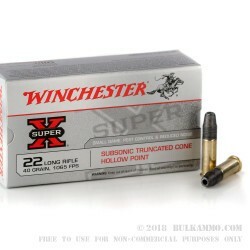 Suitable for use in all firearms that can shoot the .22LR; an added bonus that this round will generally function semi auto suppressed weapons that don’t have functionality limited by the suppressor itself. 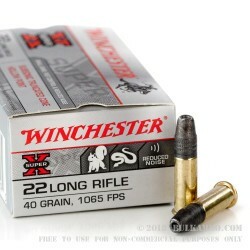 A: Hello Rick, Winchester lists the velocity of this round at 1065 fps.